Louisville’s Goodwood Brewing Co. has expanded from beer to whiskey with the release of their Stout Barrel Finish Bourbon, and stepped into a bit of controversy in the process. Stout Barrel Finish uses one of the brewery’s bourbon-turned-beer barrels to finish it. The brewery has long played with barrel aging for their beer, but this time the product is reversed. They sourced a 12-year old Kentucky Straight Bourbon Whiskey with a mashbill of 74 percent corn, 18 percent rye, and 8 percent malted barley, and re-barreled it for three more months it in their bourbon stout barrels. The final product is Goodwood Stout Barrel Finish. Bourbon barrels are just one of the “good woods” they use to finish each of their brews; red wine, tequila, rum, and brandy casks have all made their way through the tap room. These sourced 12-year barrels were rumored to be the bourbon world’s first look at what’s come out of the Warehouse 30 Collapse at Barton 1792 last year. Whether a fan theory or a press effort by the brewery to drive hype, the story was quickly stifled. Any barrels sourced from Sazerac’s (parent company of Barton 1792) ample stores come with a caveat: a gag order on the information about where the barrels may have originated. These are fairly common practice in the sourcing world, but it’s unusual for a distillery to come out and outright deny the accuracy of rumors—which is exactly what Barton did. Sazerac still holds all those Warehouse 30 barrels, according to their statement to Minnick. Sources tell The Bourbon Review the Warehouse 30 barrels in question are still in quarantine, anyway. 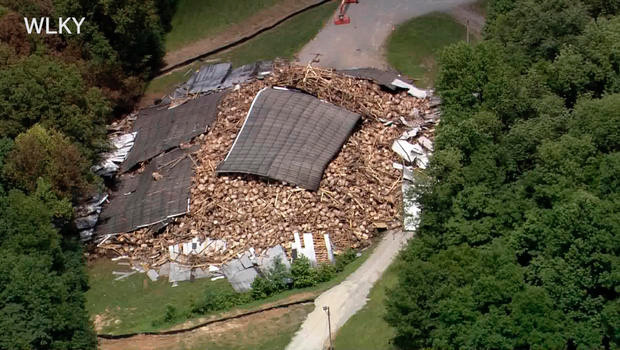 Barton is still determining the cause of the collapse, and lost over half the barrels involved. The survivors are under a close eye in case they show signs of damage or contamination. We’re also told that much of what was housed there was brandy. But to play conspiracy theorist for a moment, it’s important to remember that Warehouse 30 isn’t the only rick house at the distillery. The product is pure Kentucky, which rules out sources from Lawrenceburg, IN, or Tullahoma, TN. While the 74% corn mashbill doesn’t line up with unconfirmed reports of the standard Barton mashbill, it’s possible Goodwood’s whiskey could be high rye 1792, for which we also don’t have a confirmed mashbill. It’s also possible that Goodwood bought barrels of Barton from a broker, and at some point in the conversation, mistakenly conflated the distillery with the infamous rick house, let it slip in their excitement over the product, then backtracked on their claims when served with a cease and desist from Sazerac. Either way, we think the whiskey should be allowed to speak for itself. The official word from Goodwood is that they “invested a great deal of time, energy and money researching premium bourbon and the reviews have been tremendous on our unique expression,” and add that the beer barrel aging “lends malt sweetness and a cocoa character to the robust whiskey tones of vanilla and sweet caramel.” Sounds tasty. Goodwood Stout Barrel Finish is bottled at 90 proof and is hitting shelves early this month at an MSRP of $110. The release will be limited at first—only at select retailers in Louisville (notably the taproom itself) and Lexington—but will make it way to other markets in Kentucky soon after.